Michael Tse’s (謝天華) career skyrocketed after his performance as Laughing Gor in 2009’s E.U. <學警狙擊>. The story of his character has spawned one television drama spin-offs and two successful films. Michael is a self-professed party animal, and although the 45-year-old actor has been consistently caught hitting the clubs and photographed with female companions, his wife of seven years, Tina Lee (李天恩), continues to stick with him through thick and thin. Three years ago, Tina was rushed to the hospital after she reportedly fainted in her home. Tabloids claimed that Tina had tried to commit suicide after she found out that Michael had cheated on her; however, Michael quickly clarified that Tina fainted because of stomach convulsions. The post was deleted hours later. Umm… and his fans are retarded because? Just by being his fans I suppose. Umm… and his fans are retarded because? no because they were bothering her. Tina was definitely overreacting to that fan’s comment. If she really cared for her husband and his career, she should not have offended his fans like that. After all, a star is only a star if they have fans. Shocked at Tina’s comments of MT’s fans. Obviously she’ll hold MT back if this continues. A star without his fans is not a star! Is it POSSIBLE that his fans have … romantic crushes on him and therefore see her as an unwelcome flaw in their … fantasies!??? If I’m correct she is an educated woman and teaches at an university. Though I agree that the sister in law thing is uhm quite overboard, the comment:“None of your business… also, are we close?” she made was a bit harsch towards that specific person. She could have been more diplomatic for being upset doesn’t help anything in what she is not happy with and being upset creates more negative news in this case for her. As for her comment: “mentally retarded,”. I really hope she is directing this to the a specific person/fan who made a nasty comment. If directed to all fans, it would be totally unfit to say. Calling someone “sister-in-law” in Cantonese is a form of respect, sort of like calling a women ma’am in Europe. The literal saying is “ah so” in Cantonese, it’s rather normal for fans to refer to their idols wife as “sister-in-law” in Cantonese. thank you for correcting me. now i remember it was joe’s wife indeed. sorry all for the mistake. She was indeed directing her comment to the hordes of so-called “fans” who harrassed her in her weibo and went so far as to wish her infertility and a divorce. The fan might also be addressing her “sister-in-law’ just as a laughing gor/e.u. reference really. “Ah so” is what all the people usually address the wife of the triad members. I also questioned on the translation of the quote. “Add oil” seems a bit off and after thinking about it for a while and translating that to Cantonese, I think the fan was saying “Jia You”. Can’t think of the correct translation but something along the line of someone saying “Ganbatte” in Japan or “Fighting” in Korea. I have no respect for Tina whatsoever. It doesn’t matter how upset you are at someone, you don’t go using that term. Perhaps this is her way of dealing with being in the shadows and not being able to have kids? She is not a looker and neither is he, however, given his popularity I can see people being attracted to him. She probably feels insecure with all these fans. I’m not one to make comments about people’s outward appearence, but the use of the term really ticks me off. It also shows a lack of class on her part. I think that, being the spouse of a celebrity, he/she has to take certain criticisms or comments from the fans. Just either laugh at them or ignore them with class. and i bet the suicide rumor is true too. it’s not surprising…at her age and not having a kid, hubby so darn good looking and charming and famous! she gets flarred up easily. it’s a pressure. i dont like her anyway. she is not good looking ….. i like laughing gor tho. i think he’s v charming 🙂 call me bias! ahah! 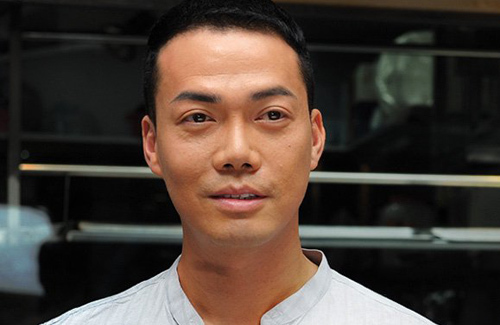 Michael Tse has certain charm for women, but is surely not a handsome man. I can never call him a handsome actor. I think it is Michael Tse’s problem that he is easily attached to women. He should behave a bit better to give security to his wife. Shu Qi in ‘Gorgeous’: Sense of security is given by ownself to ownself. He is never or ever a handsome man b4 or after his popularity. He is a fine actor & he has a fit physique. Acting wise is ok & stable. Problem is he is always in the shadow of laughing gor even though he has acted in various roles. In short he is just a so-so actor & moderate looking face . Agree with you, tvbmaniac. To me, MT has never been handsome, and most of his recent roles can’t seem to get out of laughing gor’s shadow. Or it could be he’s quite 1 note. The fan comments about needing a baby don’t seem too bad? As for the part ‘sister in law’, wouldn’t it mean the fan think of MT as big brother? So why the anger? I don’t get that. Like you can get irritated when someone rub you the wrong way (mention sensitive thing like baby), but surely not because of ‘sister in law? I also don’t think he is handsome. Where to see picture of his wife? You can google her name and Michael’s. Michael has always been paired with gorgeous women on TV so I kind of expected his wife to look pretty as well. To be frankly honest, she’s ugly as heck. The wife obviously have issues due to her inability to have kids. Otherwise, I don’t understand why someone would react so strongly to a comment like this. I think she’s the one who is “mentally retarded” judging by the way she is. How do you know she is infertile? what if Michael doesn’t want kids? That is not a good picture of Michael. Anyway the wife is at fault. The 1st reply was just being nice, the rest was provoked. And any wife of a celebrity who calls fans mental retard runs the risk of ruining her husband’s career. What a mental retard to reply she did. “any wife of a celebrity who calls fans mental retard runs the risk of ruining her husband’s career. What a mental retard to reply she did”. if her comment really would ruining michael’s career then his fans are just really mental retard. That hen comment was disgusting. Women shouldn’t be defined by their ability/inability to have children. However, her latching on to a rather innocuous comment was a mistake and attacking the fans who pay for her lifestyle was an even bigger one. Yes, the fan went too far with the hen comment. That was totally inappropriate. As a celebrity’s wife, her EQ should be much higher than this! Why? Celebrity’s wives are human too. She is not a Stepford wife. I never see Michael Tse’s (謝天華) as LaughingGo anymore, he is JJ to me now o(≧3≦)o!!!! I’m too hooked with “Friendly Fire-法網狙擊”! There is absolutely no excuse for Tina to use such a disgusting term to dissed the fans. This really show her true character. It’s because of the fans that her husband has a job and her living in that big house. The fan’s comment wasn’t meant to be negative. Every fan has their own emotional connection to their idol. Calling her sister-in-law is an endearing term for fans because the fans care for him. They followed his career for years making them feel close like family even though they are not. Tina over reacted. She has a lot to learn how to support her husband. What does she expect uploading a pic to the public. I have to say I proud of other fans stepping up for the fan that she dissed. The fan is just posting encouragement message. Honestly, calling her ‘sister in-law’ mean the fans accepted her as Michael’s spouse. Yes, you can say fans have no say on his/her idols relationship. But, isn’t it good and something to be happy about that the fans except you? Although I do know couples who have to deal with infertility, and constantly having people ask, “when are you planning for a baby” can hurt… I don’t know what the issue is between Michael and his wife though. Perhaps they’re fine the way they are and don’t wish for a baby. That fan was dictating what would look good in the picture. If a celeb and their spouse have children or not, it should not be anyone’s business but theirs. That comment was rude and presumptious, and then the fan addressed Tina as if she is their personal friend. I agree with Lee about the hen comment. A woman is still 100% a woman even if she does not have children. All women will not be mothers. That fan needs to take his/her place. shame on the others who defended that rude fan. And you wonder why Tina said what she said…….go figure. In a very, very, VERY ideal world I would agree with you that all the fans should support their idols and leave them alone. But this isn’t a very ideal world, is it? Celebrities are public figures, by definition that means that not everything about them is entirely private unless they keep it tight behind closed doors. What makes this situation worse is that it was on the Internet. This is the Internet for crying out loud! Flame Wars, Trolling, Stalking, you name it, have started for less. There was not any malintent (pardon the slang) from what I can gather, however, that could probably be seen as support or sarcasm. But the Internet doesn’t have tone unless he sent her a voice clip, it’s just words. However, knowing her husband is a celebrity and one that has been popular for quit some time. Was it really hard to let it go? It was more then likely a supportive fan with encouraging words. That comment, as I said really could’ve gone either way but her reaction was pretty extreme. She pretty much opened the can of worms for the hen comment, inviting not only fans but also the darker side of the Internet. The Internet is great for many things, but it truly shows what humanity can be capable of sometimes when we have no consequences to account for. At least now she’ll know better next time. Lesson learned I hope, after seven years. Flip the coin, if you are not keen on having baby, ppls say having a baby in a picture would make it look nicer, you would just go on and say maybe later, maybe the picture is already satisfied you for now. There are easier way to response to it, the fact that she’s overacting show that it’s a sensitive subject, which really outsider ppls really know about. None of us would know about the stage of her ability to get pregnant if she didn’t explode on someone’s joking comment. While she did over-react to the very first comment, what I think is overdone is how the other so-called “fans” bombarded her with really nasty words and even cursing her with infertility and divorce. i glad carina lau, cherie ying, joey meng r not behaving & critisizing like “someone”…I blieve u know what the ladies have in common but they r still nice? I believe the initial comment by the fan had no ill intentions and was just sending blessings to Michael and his wife. Tina had overreacted. She could have easily just said, “We’re a very happy family already” or something about being happy with the status quo. She went overboard when she commented on the fan’s mental state which was totally uncalled for. Tina definitely needs to control her emotions better and to phrase her replies more politely considering she’s creating unnecessary news and gossip for her and Michael. I believe the fan’s comment is well-intention and affectionate. I first saw Tina’s outburst as screencap posted on tvb baidu. Remind me of that scene in Inbound Troubles whereby no matter how promptly the original post was deleted, still too late cos’ the post has already been screencap elsewhere. lol! Fans addressing wife of idol as “Ah Sou” is just an affectionate endearment and acceptance of her. Tina definitely overreacted with her outburst maybe because the ‘baby’ unwittingly touched a raw nerve in her. She did over-react to the first comment but the rest of it including the “mental retard” comment was directed to those who invaded her weibo after with their wishes for her infertility and divorce. Of course, she could have ignored them, but it’s pretty difficult when one is being attacked like that, celebrity wife or not. She looks cuter than her husband. I think that fans have gotten overly familiar in the last two decades in Hong Kong and have also shrewdly assessed that entertainers and their families fear negative media coverage with gives total strangers leverage in being able to use rumors and complaining as an ordinary/weaker person to besmirch someone’s identity. She is not pretty, but not ugly either. She looks okay with big eyes. Sounds like she feels a bit insecure and uncomfortable with how close fans feel to their idols. I honestly don’t think I would be comfortable if lots of people constantly did that with my other half. On one hand I understand how she might feel, on the other, I would have thought she would understand and be use to it by now and know to ignore it. Could also be a touchy subject in their family as well. Lots of possible reasons for her to react that way I guess. If she didn’t want no comment (fan’s comment) then don’t post the bloody photo! Also calling her sister-in-law was just a respect. Also if she didn’t like it..why response and upset her hubby’s fans. Honesty, don’t get it! In this case, the cause and effect is Michael’s popularity has pushed Michael to be a more photographed popular party animal. The result is more negative tabloid publicity causing a greater rift between Michael and Yina’s relationship. Definitely, Tina can not have kids if Michael is constantly out partying with other folks, right? Can undertand her reaction, after all she is just a women. If she is longing for child and won’t be able to conceive then the fans comment just press wrong button. Trying to conceive a child when you couldn’t quite is a sensitive topic for women. Whenever I see couple don’t have kids after been married for long time never really dare to asked, unless really close. MT never been good looking. He is charming but not good looking. His charm makes him good looking. Honestly, Michael isn’t even that ‘big’ of a celebrity and his wife reacts like this? Give me a break! Such a lack of class! I mean, there are even bigger celebrities out there whose spouses (whether they are in the industry or not) don’t act that way, even when provoked! It’s obviously a sore-spot with her, and she reacted poorly and emotionally when fans prodded her. It was a mistake made in haste. It’s often said that when angry the best thing to do is walk away and cool off before responding. I’m betting she wished she did that now. If indeed they are having trouble having a child it’s a really distressing event. (luckily, my wife and I didn’t have that problem). It’s not something people should be making fun of. I see a lot of you attacking her for her comments, and I agree they shouldn’t have been made… but how much are these fans of Michael’s truly fans of his when they continue to post hurtful statements about the woman he loves? Just a food for thought, what do you think a Fan’s sore spot is? Could it be that their love for their idol, you love and care for this stranger, show your admiration, in a sense you are slightly retarded for loving and caring for a stranger, that don’t even know you are existed and therefore, wouldn’t mentally retard name calling definitely rub the sore spot? Why is it every time I read about fans and spouses of artistes argue, there’s this thing about true fans? There is no such thing as a true fan. A fan is a fan, as long as not a sicko stalker fan. The argument in here is not the artiste himself but between a fan of the artiste and that of the artiste’s wife. I don’t see any negative thing with the 1st statement by a fan who was genuine in what he or she said but instead of a thank you or silence, she or he got snapped at by an unreasonably irate wife of the star. It is hard for a star to be a star but to have his wife accepted as one of their own is even harder and yet the wife was being unappreciative. It won’t bring his career down but many fans may be put off. You have to pretend if you have to, you are supporting your husband, that wasn’t some troll statement but a genuine one. The fans’ expectations are no about sense of entitlement. If you talk about entitlement, then the stars themselves have bigger egos. Strictly in this case, his wife was at fault. She was rude, inconsiderate and her usage of word shows that she is anything but classy. Can’t blame the fans for being angry. If you don’t want comments, switch it off or make your account private. Fans know stars do not know they exist. That’s why the stars reach out by creating a blog or a facebook account so that they may tell fans what they’re doing, to create a friendly sort of environment and fans being fans hold to that idea, that one glimmer of chance to interact with the star they have supported many years, not just watching their show but taking time off to drive to see them, buy their merchandise, etc. Michael is not at fault, but his wife should at least understand whatever she does, have bearing on HIS status. This is like politicians and their spouses. You can’t expect blind support and not a little courtesy. I feel that is the least a fan can ask their idol and their idol’s beloved. Like I said, if she doesn’t want comment, unfriend all these people, make it private. Either you play nice or be like Andy Lau’s wife, the voiceless, faceless, supportive presence. I think there is absolutely such a thing as a true fan! If you’re a big enough fan of MT, you’ll probably be willing to overlook his snarky wife. If you’re just a fair weather fan, then to hell w/ her! agree josie,if you are a weatherfan you cant call yourself a “fan” or you cant call yourself a fan if you only buy his cd/dvd. a true fan will support his idol in thick and thin,if im his fan no matter what his wife have to say i will still support him,make clear im his fan and not of his wife.i can dislike his wife but still his fan. Just because his wife acted in a moment and did something wrong doesn’t give free license for the “fans” to also do something wrong. For me, it doesn’t matter much if the one being called retarded was a fan or not. In my opinion, you should never post a comment like that in publicy. You should have known that a comment posted on Weibo is something you can’t take back. Even if you do it a minute later, thousands of people could have already seen it and spread it around. The hen comment is nasty. Whoever wrote this is a disgrace for any woman or man. Even if you respect your own mother, a woman not being able to be a mother is still a woman and a human being. She’s frustrated when she know she can’t have kids. Of course, she gonna get mad about that comment. The fans should support her and not putting her down. That’s Michael wife so you should respect that. I know ppl that can’t have kids. They are sad already, don’t push it.